Dr. Larry P. Arnn, President of Hillsdale College, joins Hugh Hewitt to discuss Confederate Statues, John Calhoun and Abraham Lincoln. HUGH HEWITT: You have no idea, America morning glory, how much this is going to hurt. I had dinner last night with the parents of Worthless Sam, a freshman at Hillsdale College. And I had to endure two hours of praise of Dr. Larry Arnn. I had to put up with more good words about Dr. Larry Arnn than I've heard since I met his parents. And I never met his parents. It was terrible, Dr. Arnn. LARRY P. ARNN: Well, remember, I'm holding their kid hostage. HUGH HEWITT: Well, no you're not, because he's in DC. And he's working for the vice president right now. And we were talking about whether or not he ought to take a semester off to continue to work for the vice president. And I said, of course he should. Said, Hillsdale's not going anywhere. And they said, but he'll never finish. I said, yes, he will. And besides, education of the sort that he's getting there and that he can pick up at the Kirby Center is not possible to get in cold, remote, intense Hillsdale right now. Do you agree with me? LARRY P. ARNN: Well, first of all, Hillsdale is beautiful right now and more beautiful than Washington, DC. HUGH HEWITT: See, I don't know that. I've never been invited there when it's beautiful. LARRY P. ARNN: That's right. And nor shall you be, if you keep talking like this. Yeah. So I don't know. I mean, first of all, Sam should get some experience with the vice president, who's a fine and much-admired man. And I happen to know him well. On the other hand, Sam's still pretty ignorant. He needs to be learning, too. HUGH HEWITT: There is this balance. But when you have the opportunity of a lifetime, you have to postpone that which will still be there to take that opportunity. Don't you think? LARRY P. ARNN: Well, no, because there are five Hillsdale College students working in the White House right now that have real jobs. HUGH HEWITT: I know. But they're offering him a real job. LARRY P. ARNN: Oh, OK. Yeah. All right, all right. I don't know. I'll have to talk-- now I'm remembering Sam, and what he looks like, and what he did. HUGH HEWITT: Well, you call him Worthless Sam. LARRY P. ARNN: Yeah. He is. HUGH HEWITT: They love that. HUGH HEWITT: Do you know what's funny, is that his parents- his wonderful parents-- who are USC grads-- somehow they turned out OK. They said that Dr. Arnn only insults the people that he loves. He said, well, he loves me a lot then, because I'm getting-- every week, I put up with this stuff. Hey, we have some serious stuff to talk about. I have to tell you that I gave a talk last night to a group of high-end, influential Republican donors, bundlers, influencers, well-educated people. Worthless Sam's parents, right? The doctor, MD, and Mom was a Trump activist. And I went into a room of, I would guess, 60, 70 people-- I can't quite say-- expecting that the Trump approval would be like me. I've got my problems with the president this week. And I think Tuesday was a disaster. And I really hate the Confederate memorial stuff for reasons we're going to talk about-- the Calhoun effect, and how that separates the Framers from the Confederates, and that they were not patriots. They were treasonous, though some of them had noble virtues of courage and, in warlike matters, were virtuosos. Nevertheless, we'll get to that. But I was shocked, Larry. They are 100% with Donald Trump. And they hate the media. Even the three people who didn't vote for Donald Trump-- three people in that audience voted for Kasich or Romney, one of the people that wrote in that they just couldn't bring themselves-- they didn't vote for Hillary. Those three now wish they'd voted for Donald Trump. I think the media is missing this entirely. LARRY P. ARNN: Yeah, me too. So I have a job. And I'm really busy. And it's a extremely satisfying job. And so it's only because of you that I bone up on this stuff every week and watch it in detail. But I did spend an hour this morning-- and it's early, I've been up a while-- watching the three things that Donald Trump did about this. And I am finding difficulty being critical of anything he did in one of them, in any of them. And the second one is simply beautiful. So do you know what they are? HUGH HEWITT: No. Go ahead. Talk to me. LARRY P. ARNN: In the course of it, Trump gave a-- he did some questions from the press. And he made a statement. And this is when all this is still-- the facts are unfolding. And he says, horrible thing. Very bad. People working violence upon each other, that's terrible. And he doesn't say white supremacist groups are the worst thing in ever. And he didn't say that. So the second time, he gives a statement that he has written out. You can tell he's reading it. Well, and it sounds things that he's spoken many times. He condemns white supremacists and Nazis. And he condemns everybody who works violence on everybody else. And he appeals to our patriotism, our common sense citizenship, and our love for each other, to bring us together. And he is careful to condemn every kind of person who's bad. Now, then there's this press conference. And I think that I started watching it from the beginning. This stuff is all really hard to track because it's unfolding. And for every word that Donald Trump says, there are 10 million words written about it by others. But anyway, it looked like I started at the beginning of the press conference. And I don't swear to this. And one of the first questions is a hostile question about that thing, about his statements about it. Why didn't he condemn white supremacists as the worst thing in human history? It isn't, by the way, the worst thing in human history. Every doctrine like that is the worst kind of modern Totalitarian ideology. And there are many. And white supremacy is just one of them. And they're all really vile. So he answers that. And he says that he watched the thing. And he says that he saw some of the people who were on the-- he said to the reporter, what you call the Alt-left attacking other people with clubs. Well, I haven't watched that. But if he saw that, he's right to condemn it. And he's careful to say that that's what he's condemning. Then he says that there were some good people, he thinks, by watching their behavior on camera, among the people who were there to protest the taking down of the statue of Robert E. Lee. And then he made some defense of keeping the statue of Robert E. Lee, which I am going to make this morning, if I get the chance. HUGH HEWITT: Oh, we're going to disagree. But go ahead. LARRY P. ARNN: Yeah. And see, you're going to-- Hugh, you're about to end up in an argument not with me- which argument you could not win. You're about to end up in an argument with Abraham Lincoln. HUGH HEWITT: Well, I could beat him. HUGH HEWITT: I've got Stephen Douglas's stuff. No, I'm joking, people. LARRY P. ARNN: Yeah. There you go. LARRY P. ARNN: --to find these transcripts. HUGH HEWITT: -- what the low point of the week was? If you watch that press conference, a quote "reporter," someone in that crowd shouted out the question, do you approve of the Confederacy? LARRY P. ARNN: Yeah, I heard that. HUGH HEWITT: That's the dumbest question ever issued at-- I mean, I'm making an absolute statement. That is the dumbest question ever issued. It is a waste of space and time on a question designed to cause a political problem for a president, with no pretense of having anything to do with anything. LARRY P. ARNN: Yeah. And that, see it-- so do you want to-- so, first of all, let's talk about-- do you want to talk about Robert E. Lee? HUGH HEWITT: First, no. First, I want to tell you that, in The New York Times today-- which you must read-- there is a story on the Antifa, all right? And within that story on the Antifa, the violent left wingers, there is a link to the key Antifa itsgoingdown.org website. And on the itsgoingdown.org website, there is an open letter by Why We Fought in Charlottesville: A Letter on the Dangers Ahead, which perfectly proves that they're crazy, just like the anti-Semitic neo-Nazi nuts are crazy. And all I'm trying to do all week long is bring proportionality to this conversation. 63 million people voted for Donald Trump. And I ask audiences, do you think that 10% of those 6 million people are Nazis? Of course not. Do you think 1% of those people-- 600,000 people-- are Nazis? Well, of course not. Do you think 1/10 of 1%, 60,000 of them, are Nazis? Then they start to say, well, maybe. I say, no, they're not. But maybe 6,000 of them are. And they're evil people. But where in the world are the other 62,994,000 people being represented in the media? And that's why my bottom takeaway from last night is the Trump supporters out there hate the media. More than almost anything else, they hate the media now. And Donald Trump is running against the media. He's totally disassociated from the Republican Party. He's a party of one now. And he's at war with the Republicans. He's at war with everyone. But his main opponent is the media. LARRY P. ARNN: Yeah. Well, and the media can't-- in my opinion, the modern media can't really be understood, except as an element in a complex of things that grow from the modern university. And there's thinking people in there. And there are members of the vast administrative state. And there's the chattering classes of all kinds. And, by and large, what they think are the doctrines that have taken over the modern academic world. And those are very serious doctrines, by the way. It's important to learn what those are. And so he's up against all of that. And he's not finding many people ready to follow him. HUGH HEWITT: I will be right back with Dr. Larry Arnn. We talk about Confederate statutes, John Calhoun, and the break with Jefferson that occurred, that people need to understand to make the argument without falling into the quicksand. Because it is the Hillsdale Dialogue, all things Hillsdale at Hillsdale.edu. Welcome back, Americans. Hugh Hewitt. The Hillsdale Dialogue, my weekly sit down with Dr. Larry Arnn, President of Hillsdale College, or one of his colleagues, on all things Hillsdale which are collected at hillsdale.edu. I would recommend you begin with the course on the Constitution, which is there. All of our conversations dating back to the beginning, many years ago when we started with Homer and The Iliad-- going to confuse the heck out of the Steelers fans this morning-- can be all listened to, binge listened to, at hughforhillsdale.com. You can sign up for Imprimis, the speech digest of Hillsdale College, completely free. And you will be better for it. Dr. Arnn, on one of those happy, happy occasions, when I was talking with one of your colleagues and not you-- Paul Rahe-- we were talking about John Calhoun. And it occurred to me that he's the man that broke the understanding that we had at the framing that slavery was evil. And when people ask me, it ends, doesn't it, in the taking down of the Jefferson Memorial and the Washington Monument? Say, no, it doesn't. Not if people have a brain, because they will understand what Dr. Arnn has said many times. Everyone understood the moral evil of slavery at the time of the founding. But Calhoun erased that or tried to. Am I correct? LARRY P. ARNN: Well, yes. But, of course, Calhoun-- lots of people did that. Calhoun was a student of a student of Friedrich Hegel. And on both the left and the right, we have to read our Winston Churchill again. Come to find out that the doctrines of history have replaced, extensively, the doctrine of nature. Nature says, you're a human, and I'm a human. And that means we've got to be treated the same way. And we can tell if we're human because we can reason and talk. So Calhoun has a different idea. I'll read from something from 1848. "But I take higher ground. I hold that in the present state of civilization, where two races of different origin, and distinguished by color and other physical differences, as well as intellectual, are brought together, the relation now existing in the slaveholding States between the two is, instead of an evil, a good-- a positive good." Now what to notice about that, that's the great, famous, positive good school of slavery born there. But what's to note about that is think of the circumstances he described. First of all, in the Declaration of Independence, "When in the course of human events." That means any time. And then later, "All men are created equal." Calhoun says, "In the present state." And then he speaks of the origin of the races. And then he talks about how they have developed. You see? So now everything is history, not nature. And he goes on to explain, in another speech, that the inferior race being with as equal citizens the superior race is an abomination. Now that's Nazi doctrine, right? LARRY P. ARNN: And what's interesting, though-- because we want to save our country. And that means we want to protect the rights of everyone, or at least I do. And you do, too, I know. So what we need to do is understand that these ideas that come into America and become virulent first on the right, they're also on the left. Churchill said of Communism and Nazism that they differ as the North Pole differs from the South. I say, when you look at them, it's hard to see they're very different, even if they're very far apart on a spectrum. So what is it? One of them thinks that there are these evolutionary process unfolding according to class. And the other thinks there's this evolutionary process unfolding according to race. And that both of them aim toward a kind of unlimited, engineering project sort of government to control those processes and make them go the way we want them to. And that's what happens if you abandon the standard of human nature. And so John Calhoun is a-- and I'm about to say I would probably-- although I have some doubt about this-- keep his statues up, because this is important stuff to know. And John Calhoun is a very important guy. HUGH HEWITT: I would-- I'm glad they changed the name of the college at Yale. I really am. And I wish they would put all of these statues, all of them-- and we'll talk about this after the break-- in museums. Not destroy them, not be wreckers. But we're heading into a period of time where, sort of like the Reformation in England where they wrecked everything, they defaced the statue of Abraham Lincoln in Chicago. Did you see that? LARRY P. ARNN: I did see that. HUGH HEWITT: It is the idiocy of our time, but somebody in this movement attacked a Lincoln statue. Stay tuned. Dr. Arnn and I will be back right after the break on the Hillsdale Dialogue, all things Hillsdale at hillsdale.edu. SPEAKER 3: Portions of the Hugh Hewitt Show are brought to you in part by Job Creators Network. HUGH HEWITT: Welcome back, America. It's Hugh Hewitt. It is the Hillsdale Dialogue, my weekly conversation with Dr. Larry Arnn about all the news that matters. And normally, we were going to talk about Article II of the Constitution today. But the week has been significant. And I just always feel like we have to stop and pause with someone who thinks about this. Three minutes ago, the President of the United States tweeted, Dr. Arnn, "Homeland Security and law enforcement are on alert and closely watching for any sign of trouble. Our borders are far tougher than ever before!" Exclamation point. How are they going to make that into a controversy? LARRY P. ARNN: Well, the exclamation point. He shouldn't be so excited about that. Yeah, so Calhoun is a bad guy. And I'll tell you why I have a doubt about this. I'm going to read you something from Lincoln before we're done today, if you let me. But Calhoun is, as you rightly point out, a direct rebel against-- not just against the principles of the American Revolution, which are the principles of human rights, equal rights for all human beings. And so he also-- Calhoun is a modern, Progressive scientist. In the disquisition on government, which I attribute to Hillsdale college students, I once, by mistake, on a syllabus assigned them to read that whole book in a freshman Constitution course. And they all did. LARRY P. ARNN: It's amazing. And then they still-- all the members of that class who are hearing this today, they will have a moment of pride, because they remember that they did that. And they didn't complain. Although later, when I told them that it was a mistake, they did. HUGH HEWITT: Well, they should have. Actually, I think they have damages coming to them. LARRY P. ARNN: Here's a sentence, which I quote from memory. But it's a close paraphrase, at worst. "It would be impious to think that God would give us the power of modern science and permit us to use it for evil." So you see? In other words, whatever power we can get, Calhoun thinks it's legitimate to use it. HUGH HEWITT: He had-- and when I talked with Dr. Rahe about him for a few weeks when you were missing, I had come to the conclusion that Calhoun had to invent a philosophy to fit his circumstances, to justify the moral disorder in which he found himself. That he was smart, and he knew he was living an immoral life in the way that he defended slavery, and the right of secession, the right of nullification. And he invented an entire theory. But you're telling me it had antecedent roots in Hegel, et cetera. HUGH HEWITT: But he created a construct to justify himself. LARRY P. ARNN: The reason we have to keep the memory of this alive is because it's present among us today. And you have to understand why what he believed is attractive. It's attractive because if it were true, it opens the prospect that we could create a utopia here on Earth. And both on the left and the right, they're driven to their extremes by that hope. In other words, it's a love and attraction that pulled him. He could imagine-- he writes in one place that, in our ownership of slaves, all whites are turned into aristocrats. Aristocrat means the rule of the best. You see? He thinks that the hierarchy, and the order, and the forms that are produced by slavery make the whole society better, including, he went on to say, the slaves. And I answer that last point that, if it was so good for them, and they were so happy, why did they keep trying to get away? HUGH HEWITT: Yeah. Tell me now about Lincoln and what he had to say about statues of Lee. I mean, you referenced this early. And you've got me intrigued. LARRY P. ARNN: Well, first of all, one of the most beautiful things any president of the United States ever said-- any politician in any age ever said-- is Lincoln's second inaugural address. And that, if you just will listen to Donald Trump at his best, he is appealing to the sentiment I'm about to read to you. First of all, the worst war in our history is not quite over when Lincoln gives his second inaugural. But it looks like it's going to be won. He doesn't even predict that. But he interprets the meaning of the war. And this is beautiful. The whole thing is beautiful, by the way. But I'll just read this passage. He's speaking of the North and the South. And to this minute, by the way, no number of Americans, in absolute terms-- forget percentage of the population-- have been killed in a war as many as in the Civil War, to this minute. "Both read the same Bible and pray to the same God, and each invokes his aid against the other. It may seem strange that any man should dare to ask a just God's assistance in wringing their bread from the sweat of other men's faces." That's the only condemnation of the South that appears in this speech. But then he goes on. "But let us judge not, that we be not judged. The prayers of both could not be answered. That of neither has been answered fully. The Almighty has His," capital His, "own purposes." Then the quote from the Bible. "Woe unto the world because of offenses, for it must needs be that offenses come, but woe to that man by whom the offense cometh." Now, "If we shall suppose that American slavery is one of those offenses which, in the providence of God, must needs come, but which having continued through His," His, capital H, "appointed time, He now wills to remove, and that He gives to both North and South this terrible war as the woe due to those by whom the offense come, shall we discern therein any departure from those divine attributes which the believers in a living God always ascribe to Him?" You see? We both did it. And we can find our unity again by both taking responsibility. And that means that it's the opposite of this thing where we gather in our extremes of left and right and condemn each other, and say that we are the ones who hold all hope for the future. Now read this. "Fondly do we hope, fervently do we pray, that this mighty scourge of war might speedily pass away. Yet, if God wills that it continue until all the wealth piled up by the bondsman's 250 years of unrequited toil shall be sunk, and until every drop of blood drawn with the lash shall be paid by another drawn with the sword, as was said 3,000 years ago, so still it must be said 'the judgments of the Lord are true and righteous altogether.'" You see what that means? That means that this Civil War that we had is a great test and revelation of the meaning of America and the struggle that we have had to live up to that. And we have all fallen short. And we can be fellow-citizens if we resolve, from our shortcomings and the memory of our shames, to try again and do better in love with each other. That's what Lincoln is saying. And it's lovely. HUGH HEWITT: It's the greatest speech ever written. I've often said that people love the Gettysburg Address more. But they ought not to because of the summing up there, and the fact that it comes after 600,000 are dead. The Gettysburg Address comes in the middle of it. This comes at the end of it. And Drew Gilpin Faust, the president of Harvard, wrote a book called The Republic of Sorrow. 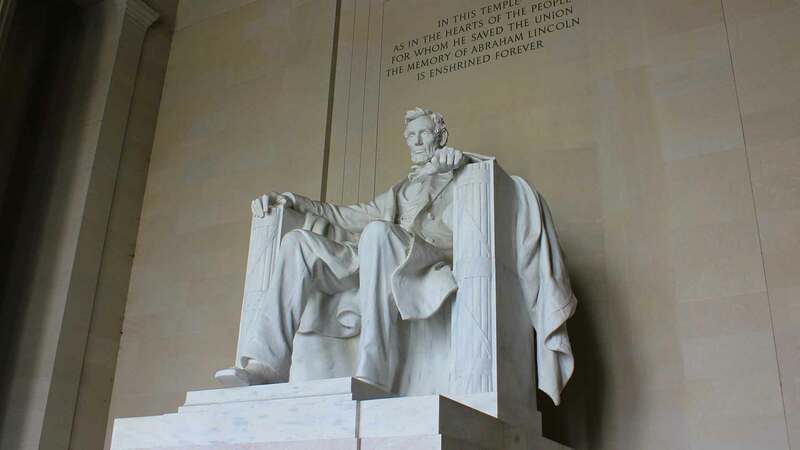 Lincoln was presiding over a republic of sorrow. 600,000 people dead. Think of the number of family members, immediate family members, who had lost someone in the war, dead. That doesn't count the amputees and the people with no faces, et cetera. It's just the republic of sorrow. So he had to speak to that. HUGH HEWITT: His second statement was fine. It was his third one. I say this, Larry. And I don't want to make light by using an analogy about golf. But I do use it to illustrate it. President Trump talks about race the way that I play golf. I do not intend to play golf the way that I play golf. I would like to play golf well. But I can't, and I don't practice enough. And he doesn't talk about race well often enough because he doesn't practice enough. And his wordsmiths are not competent. And he should never get into those volleys with the press, because his anger at the media overtakes his ability to keep up with the narrative. That's where it went off the rails. LARRY P. ARNN: Well, I don't know. First of all, I watched it this morning. So what do I know? And we have to remember, first of all, I make mistakes all the time. And I even make them on this show. And you point them out. HUGH HEWITT: We're not supposed to say that. But yes. LARRY P. ARNN: Sorry. I did. LARRY P. ARNN: Why? Well, what I mean, I mean that in a literal sense. He has murdered another human being in the name of a vile doctrine. We're not supposed to pretend that that's the only vile doctrine or, indeed, even that it's the worst vile doctrine. It's tied for the worst with every doctrine like it. HUGH HEWITT: And I do wish that people would go to the Antifa article in The New York Times, and then click on to the Antifa website and read the Antifa letter, because it is chilling. The amplification of the extremes in this country, which are less than 1/100th of a percent of the left that is violent and less than 1/100 % of the right that is violent. But they are chilling, and they are loud. And they're amplified. And now they're monetized. And that's new. And when we come back from break, we'll talk about that. That's why Hillsdale College matters so much, by the way. Why you ought to support Hillsdale College? Because we need lanterns of liberty and lanterns in the North, South, East, and West like Hillsdale and schools that grow up and charter school them like them. HUGH HEWITT: Welcome back, Americans. Hugh Hewitt with Dr. Larry Arnn, president of Hillsdale College. Hillsdale.edu is where you find everything Hillsdale. All things Hillsdale collected at hillsdale.edu. And my conversations with Dr. Arnn and his colleagues dating back to 2014 are all available at hughforhillsdale.com. Dr. Arnn, during the break, I was watching on MSNBC Morning Joe. And the lower third, the text, "Some in GOP gradually find courage to stand up to Trump." I must say, this is not just MSNBC. It's CNN. It's also Fox to a certain extent. There's kind of a mob mentality now among commentators where they are afraid to say anything good about Donald Trump. It's almost a frenzy among people to out condemn each other of Donald Trump. What do you make of this? LARRY P. ARNN: Well, I believe that we're living in a house divided. And I believe that it's the tensions are intense, and they're going to lead to some change. And this is what this is all about. And I mean, there's a really good article by Victor Hanson-- my buddy and colleague-- about what's going on in the country. And, first of all, the economy's doing well. Trump is doing all of the things he'd said he'd do, to the best of his ability. He's not getting much cooperation from the Congress on the big things that require legislation. Although that story's not finished yet. Those people who find the courage to stand up to Trump, isn't that kind of easy right now with the election more than a year away and the media all over you? Isn't that the easy thing to do? LARRY P. ARNN: Whereas, if you say something favorable about him, you'll be on the front page of The New York Times about what an idiot you are. I mean, probably I will be. HUGH HEWITT: Yep. But we'll be there together. But it's a remarkable moment, America. I've got to ask you about one thing, though. The president won the North Korea round. He backed North Korea down. First time we've stood up to that crazy dictator since 1994. And he got China to pass a UN Security Resolution and, apparently, to enforce sanctions. These are huge wins. And Iran is mad at us. And they are threatening to get out of the worst strategic defeat for the United States since the Vietnam War, which is the Iran deal. And they're threatened to get out of it. We might get out of it quicker. And that's a big win for Trump as well. These are important things. They're not being discussed at all. LARRY P. ARNN: Yeah. And the curtailing of the regulatory state, the spirit about that, people are investing more. There's big things going on. And a lot of these controversies are about stuff like that, because there was a quote in The Hill. And The Hill, that publication that's published every day about things on Capitol Hill, and somebody-- they quoted some senior bureaucrats. And they said, we're standing up to Trump now because we feel like we can. And that means, by the way, that what are supposed to be civil servants-- remember Churchill phrase, no longer civil, no longer servants-- are defying the political authority, which means the authority of the people of the United States. That's what that means. And then one said, well, he says he's going to drain the swamp. We're the swamp. Well, of course, there's a fight on about that. And what I think is, I keep saying to people, I don't really know Donald Trump. I don't. I know that he wrote, in a bestselling book, that he thought that he could bed Princess Diana. I'm even hesitant to bring that up because I'm offended by it. I think it was wrong. He doesn't talk that way anymore. Bless him. But on the other hand, he's got a wife, even his former wives, and daughters who just love him. And they're fine people, these daughters. So I don't know if Donald Trump is a bad man or not. I can only judge what he proposes to do and whether he does it. And almost everything that he proposes to do and is seeking to do is what he promised. And I'm for that. HUGH HEWITT: Yeah. So where does it-- my last question. We have three minutes. Mr. Bannon called up a Progressive outlet and undermined the president's policy yesterday. The house divided is not just the country. It's the Trump administration. How in the world does this go on? LARRY P. ARNN: Well, I don't know. I mean, first of all, if you're going to-- what was the Lincoln administration like? I mean, Congress was interfering with his supervision of his cabinet, sought to get a law through that he couldn't fire them without his permission. That happened two weeks ago about Jeff Sessions. And people in his administration were leaking all the time and calling him incompetent. And he's just this rube from Illinois. And what does he ever know? And he kept on, see? And eventually, it worked out, pretty much, in the way-- in tragedy and victory. And then, right after it worked out, somebody shot him to death, right? LARRY P. ARNN: So Donald Trump is traveling a hard road. And I wish that Donald Trump were as eloquent as Abraham Lincoln. But, on the other hand, I wish I were. And that's not easy to be. HUGH HEWITT: It's a tough burden to carry. LARRY P. ARNN: Another thing is, Trump talks a huge amount more, as modern presidents do, than Lincoln ever did. HUGH HEWITT: And they shouldn't. Boy, oh boy, if we could take one thing away, talk less. And what you say, say it better. Larry Arnn, it is always a great pleasure. All things Hillsdale available. And talk to Worthless Sam soon about staying in DC, taking advantage of that. I'll be back next week with the next Hillsdale Dialogue. And Adam, and Duane, and Ben, and all of you, thank you, America. It's the Hugh Hewitt Show.